This patient has a lot of stretch marks and sagginess and desired a tummy tuck. 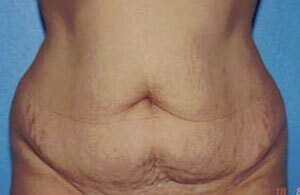 Her after photos are taken immediately following a touch up done at 8 months after her initial tummy tuck. The scar in the middle part was lowered and the excessive skin on the right lateral end (called a dog ear) was removed. Note the scar in between, which was not touched up, is barely visible.